The Micro K'NEX parts below have now been discontinued. 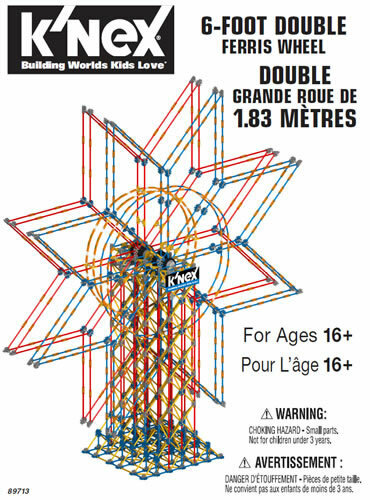 Click on any image to view further details, or view current Micro K'NEX parts. Uses metal pin connectors - can only be connected to other pin-jointed track. Approx.length 410mm (16in.) Uses metal pin connectors - can only be connected to other pin-jointed track. Can only be connected to other pin-jointed track. Charging cable for the Air-propelled Micro K'NEX coaster car, as used in the Web Weaver roller coaster building set. The earliest Micro K'NEX sets did not use the same Micro K'NEX rods and connectors in universal use in current sets. Not only were the rods and connectors different colours, but also the rods were different lengths. 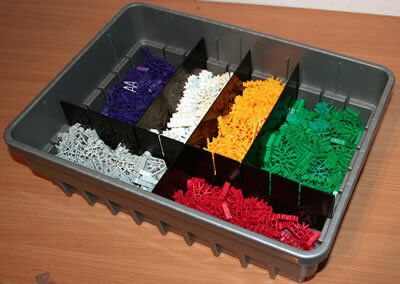 This is a unique opportunity to obtain approximately 1,000 of these non-standard Micro K'NEX parts, supplied sorted in a compartmented tray. 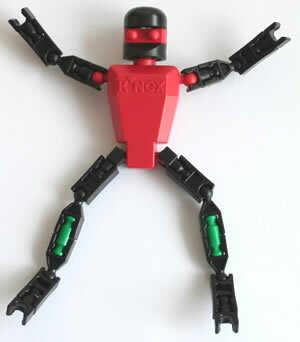 Note that Micro K'NEX parts are much smaller than the various classic K'NEX parts shown on this web page. Pack weight 1.5Kg (3.3lb) including tray. Please email if you require more information.